Contents. List of Contributors. 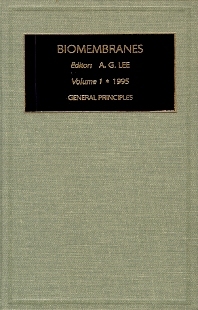 Preface (A.G. Lee). The Functional Roles of Lipids in Biological Membranes (D.B. Fenske, M.A. Monck, M.J. Hope, and P.R. Cullis). Principles of Membrane Protein Structure (M.S.P. Sansom and I.D. Kerr). Fatty Acid- and Isoprenoid-Linked Membrane Proteins (M. Parenti and A.I. Magee). The Biosynthesis of Membrane Proteins (D. Stephens, S. Kulkami, and B. Austen). Specifity of Lipid-Protein Interactions (D. Marsh). Effects of Lipid-Protein Interactions on Membrane Function (A.G. Lee). General Principles of Membrane Transport (I.C. West). Membrane Signaling Systems (C.U.M. Smith). Progress in understanding the nature of the biological membrane has been very rapid over a broad front, but still pockets of ignorance remain. Application of the techniques of molecular biology has provided the sequences of a very large number of membrane proteins, and has led to the discovery of superfamilies of membrane proteins of related structure. In turn, the identification of these superfamilies has led to new ways of thinking about membrane processes. Many of these processes can now be discussed in molecular terms, and unexpected relationships between apparently unrelated phenomena are bringing a new unity to the study of biological membranes. The quantity of information available about membrane proteins is now too large for any one person to be familiar with anything but a very small part of the primary literature. A series of volumes concentrating on molecular aspects of biological membranes therefore seems timely. The hope is that, when complete, these volumes will provide a convenient introduction to the study of a wide range of membrane functions. This first volume is devoted to general surveys of the structure and synthesis of membrane proteins and lipids, of the interactions between lipids and proteins, and of the functions of biological membranes.